Located on four acres of exquisitely landscaped grounds surrounded by miles of twinkling lights from Las Vegas’ Strip, Sunset Gardens has been providing premium ceremony and reception services for the past two decades. The Sunset Gardens features three private banquet rooms, namely the Garden Room, the Terrace Room, and the Sunset Room, each with beautifully manicured outdoor garden courtyards that can accommodate up to 300 guests comfortably. The Sunset Gardens also has a charming Wedding Chapel, which is perfect for romantic and traditional ceremonies and services, and an outdoor Pavilion with a picturesque gazebo. A variety of customized wedding packages are available to suit every budget and taste, and a team of experienced coordinating staff are on hand to help with the event. The Sunset Gardens features a charming Wedding Chapel with substantial pane windows that flood the interior with natural light and boast beautiful views of the landscaped gardens, high vaulted ceilings with wooden beams that is perfect for romantic ceremonies. The Garden Room is the most substantial banquet hall at Sunset Gardens and can accommodate between 125 and 300 guests for seated dinners and cocktail receptions, and the Terrace Room is a medium-sized space that can host up to 120 guests for receptions. The Sunset Room is a cozy space for cocktail parties and dinners for up to 60 guests. The Pavilion offers a stunning outdoor ceremony space with a beautiful gazebo for the bride and groom to say their vows and picturesque views of the surrounding flower gardens and trees that have been adorned with white star lights. Sunset Gardens offers a variety of packages for ceremonies and receptions and a combination of both for a range of budgets and tastes. Packages include basics such as tables, chairs, centerpieces, linens, napkins, and complementing décor and tableware, as well as a non-denominational minister for ceremonies and a professional photographer. Some packages have catering included, with nine-item buffets of hors-d'oeuvres, salads, entrées and sides, and a customized wedding cake and cutting services. Couples can create their playlists for music to be played by a professional DJ, and fully-stocked bar will be available for four hours of the reception time. 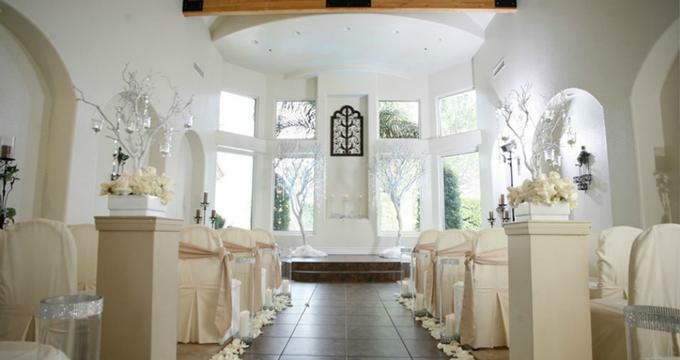 Ceremony Packages include a private indoor chapel ceremony overlooking our elaborate gardens, the use of a bridal suite and dressing room, traditional wedding music for the service, and unlimited photography. Also offered are customized floral arrangements, a complimentary bottle of Champagne, a bridal bouquet and groom’s boutonniere, a professional wedding coordinator, and a non-denominational minister. Ceremony and Reception Packages include all the services of a ceremony package, as well as a private indoor chapel daytime ceremony and a daytime cocktail reception, a professional DJ/emcee, a two-tier customized wedding cake, and an open bar with premium liquor, beer, wine, juice, and soda. Catering includes appetizers and hors-d'oeuvres, and there are indoor and outdoor garden photo options, floral credit and a wedding coordinator, and a non-denominational minister also available. Sunset Gardens is located at 3931 E Sunset Road, is wheelchair accessible, has complimentary wireless Internet connectivity around the property, and offers complimentary onsite parking.